Mark Mothersbaugh "Music for Six-Sided Keyboard"
Current residencies at Wanderlust Yoga Austin and Fairmont Austin Hotel. DJ CASS&RA (pronounced DJ Cassandra – female DJ based in Austin, TX) is the DJ side project of composer + keyboardist Cassie Shankman. She primarily plays a mix of funk, disco and house, but other sets have included classic hip-hop, rap, indie-electronic-pop, club mixes, top-40s, and world music (open format DJ). As a trained musician who understands the musical theory behind songs, Cassie began DJing friends' house parties, creating a good vibe, and began growing her audience and clients. She's DJ'd for crowds of over 3,000 people. Check out her facebook here and Instagram here. Even though Cassie DJ's for many different events, Cassie specializes in DJing for health & wellness clients/events. Her day job is working with the Movement Tracks Project designing original Biomedical Music™ to help people move and by "night" she creates the perfect sets for movement for her clients, whether it be a morning yoga class or a late-night dance party. To hire DJ CASS&RA for weddings, she can act as not only a DJ, but also a wedding coordinator if needed. She can travel anywhere by car in Texas, and is available for out-of-state weddings as well. Juice Society X The Refinery June 2018 "Yoga + Live DJ Happy Hour class collab with yogi Om and the City (Jules Hunt)"
Revelry Presents 2018 "Makers Market at Mueller"
Revelry, Wright Bros. Brew & Brew, and Lemon Lounge's 2018 "Lovefest 003: Blooms & Brews"
Revelry's 2017 "Eastside Holiday Market"
PRIZE's "Kate Hersch Trunk Show"
Revelry's 2017 Austin's First Dessert Fest / "Hey Sugar! Dessert Fest"
Revelry Presents 2017 "Makers Market at Mueller"
Crux Climbing Center 2017 Annual Halloween Competition "Crank n' Stein"
Spredfast's 2017 "SXSW 3-Day House Party"
Revelry & Archer Hotels 2017 "Lovefest 002"
Revelry's 2016 "Eastside Holiday Market"
DJ Cass&Ra has joined Dart Collective ATX, which officially launched in April 2018. 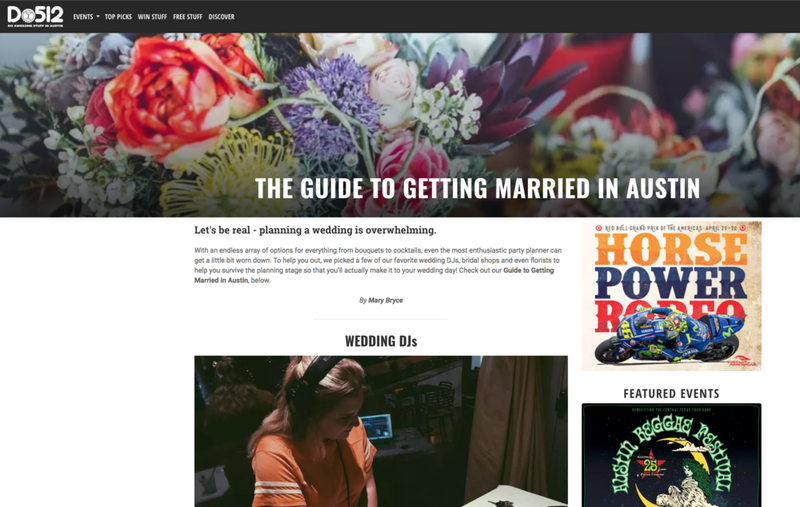 "A friend recommended that we meet with Cassie when we started looking for a wedding DJ, and we got good vibes as soon as we visited her website. We all got together for coffee soon after, and Cassie was extremely friendly, helpful and accommodating from the very start. Her warm spirit and extensive musical repertoire were a great match for us, and we met multiple times over several months to cultivate the perfect playlist for our special day. Now, if we had JUST needed a DJ, Cassie would have been great. But our request was substantially more. See, we all live in Austin, but we were getting married over six hours away in Alpine, TX, so we needed a DJ who was willing to haul their gear halfway across Texas AND keep the party going until the wee hours. On top of that, we were planning our own wedding, so we wouldn't have a day-of coordinator. We knew it was an insane ask, but Cassie smiled wide and said, "No problem at all." “We searched a while to find a good DJ for our wedding and Cassie and her assistant Alison were the best. Our wedding was scheduled to start at 5:00pm and Cassie arrived around 12:00pm to ensure that all AV equipment was set up and running perfectly. Along with any typical music cues we had scheduled during the ceremony we wanted to play a video with music after the speeches and she was ready day-of to play the video without us worrying about a thing.